Reverend Dr. Daniel Lee Simmons Sr.
African-Americans and opened fire on the group." 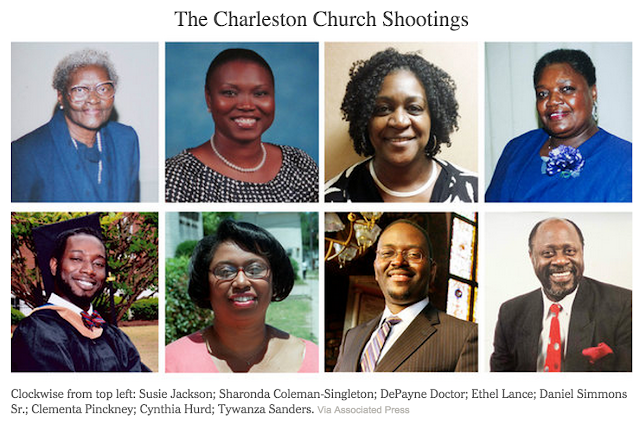 The existential question of who is black has been answered in the most concussive way possible: the nine men and women slain as they prayed last night at the Emanuel African Methodist Episcopal Church, in Charleston, South Carolina, were black. The people for whom this new tableau of horror is most rooted in American history are black as well. The people whose grief and outrage over this will inevitably be diminished with irrelevant references to intra-racial homicide are black people. There are other, more pertinent questions, not all of them answerable. The most immediate: Who did this? Was it the act of an individual or was it an organized effort? What motivates someone to commit such monstrous acts and how do they rationalize such evil? How much longer can we live like this? As a matter of morality, the actions of Dylann Roof, who confessed to the murders, may be a conundrum, but his motivations are far from inscrutable. It is unfathomable that somebody in today’s society would walk into a church while they are having a prayer meeting and take their lives. Eight of [Reverend Clementa Pinckney's] church members who might be alive if he had expressly allowed members to carry handguns in church are dead. There has been debate about South Carolina and the role and relation of the Confederacy (of which South Carolina was a part), the Confederate flag and racism in these nine murders. On Monday 22 June 2015, South Carolina's Governor, Nikki R. Haley, called for the state legislature to debate removing the Confederate flag from the statehouse grounds, where it has flown since 1961, placed there to commemorate the 100th anniversary of the beginning of the Civil War. For many people in our state, the flag stands for traditions that are noble: traditions of history, of heritage and of ancestry. The hate-filled murderer who massacred our brothers and sisters in Charleston has a sick and twisted view of the flag. In no way does he reflect the people in our state who respect and in many ways revere it. Those South Carolinians view the flag as a symbol of respect, integrity and duty. They also see it as a memorial: a way to honor ancestors who came to the service of their state during a time of conflict. That is not hate nor is it racism. At the same time, for many others in South Carolina, the flag is a deeply offensive symbol of a brutally oppressive past. As a state, we can survive and indeed we can thrive, as we have done, while still being home to both of those view points. We do not need to declare a winner and a loser here. We respect freedom of expression. And for those who wish to show their respect for the flag on their private property, no one will stand in your way. But, the statehouse is different. And the events of this past week call upon us to look at this in a different way. Fifteen years ago, after much contentious debate, South Carolina came together in a bipartisan way to move the flag from atop the capitol dome. Today, we are here in a moment of unity in our state, without ill will, to say it's time to move the flag from the capitol grounds. One hundred and fifty years after the end of the Civil War, the time has come. There will be some in our state who see this as a sad moment. I respect that. But, know this: for good and for bad, whether it is on the statehouse grounds or in a museum, the flag will always be a part of the soil of South Carolina. But this is a moment in which we can say that that flag, while an integral part of our past, does not represent the future of our great state. The murderer now locked up in Charleston said he hoped his actions would start a race war. We have an opportunity to show that not only was he wrong but that just the opposite is happening. My hope is that by removing a symbol that divides us we can move forward as a state in harmony and we can honor the nine blessed souls who are now in heaven. The General Assembly wraps up their year this week and as Governor I have the authority to call them back into session under extraordinary circumstances. I have indicated to the House and Senate that if they do not take measures to make sure this debate takes place this summer, I will use that authority for the purpose of the Legislature removing the flag from the statehouse grounds.